Over the last few months my teenage son and I have been training together at the gym before school. Whilst he is pounding the treadmill and weights, I have made a happy return to yoga asana. The lengthening of body and breath and tapping flow through movement are all delicious, but I have also been strongly drawn to bring back to body the more challenging postures of Crow, Tree and Headstands. This renewed determination is partly because of the mind discipline they nurture, but I also admit, they look super cool and there is an element of mummy showing off…I quite like my son seeing that his old hippy mum holds some serious cred in the mind/body department. Having been off the mat for a large part of this year, favouring jungle running instead, I have had to rediscover my centre and overcome the fear of injury, which has been an excellent pursuit to keep the confidence in my body strong…and let’s face it, there is no elegant way to get out of a failed Crow Pose…it’s an unavoidable faceplant. With the headstand, I noticed that when near a wall, I would execute a beautiful, graceful and stable rise and long hold, without actually needing the wall at all. Yet, when in the centre of the room, I’d wobble, resort to kicking up the shift in weight, strain my arms and neck to rebalance and often not achieve anything. The wall, whilst not physically necessary, allowed me to give myself permission to execute well, and with that permission granted, in flowed the body memory and central balance automatically. Permission is powerful, especially when moving into deeper levels of inner practice. The crazy, busy, go-go-go culture of modern life has somehow hoodwinked us into a belief that ‘doing’ stuff is of ultimate value. Forward! Onward! Upward! Get ahead! Have more! Succeed beyond the pack! Do it now! Just a quick scan of online or print advertising will reveal these messages constantly being pushed at us. There are far more verbs like “do”, “get”, and “have” used than verbs like say…”be”. And this subtle and constant emphasis on ‘doing’ is so evident in my meditation classes. It often presents as a serious cognitive dissonance and it’s one of the first things I deal with, so the students can fully engage with the practices. People sign up for meditation classes for lots of reasons, and usually because they have read enough or know enough people who do it, so understand the benefits and give it a try. Yet initially, to sit still and give the experience fully to themselves, feels a bit too much like ‘doing nothing’. It’s like their system has the foot pressed firmly to the accelerator by habit, yet the class has slipped them into neutral, so they sit there revving their engines without movement. I have learnt that by expressly inviting them to give themselves permission to be completely present in the class, even just for the next few minutes, is enough for them to take their feet off the pedal. I invite them to leave their days, concerns and to-do-lists outside the door of the meditation space, and they can pick it all up again when they leave. I invite them to fully arrive. I invite them to gift the session to themselves without any reservation. I invite then to give themselves permission…’to be’. When we start the classes this way, I hear spontaneous sighs and shifts into deeper breathing. I see shoulders relax and bodies sink into mats for the meditations experienced lying down, like Yoga Nidra (or body scanning). We are so entrained into relentless ‘doing’ that we really don’t know what we’re doing until we interrupt the pattern with permission to stop. This year I have explicitly worked with it on a number of fronts which has enabled huge expansion in my sense of self and personal power. I have given myself permission to say ‘no’; to switch off my phone; to dance more wildly; to teach more passionately; to walk away from toxic people; to love more fiercely; to express openly my spiritual path and to step unabashed and unapologetically into new levels of mastery. And having worked with permission in this way, I have allowed into my experience a whole new field of possibility, potentials and relationships. 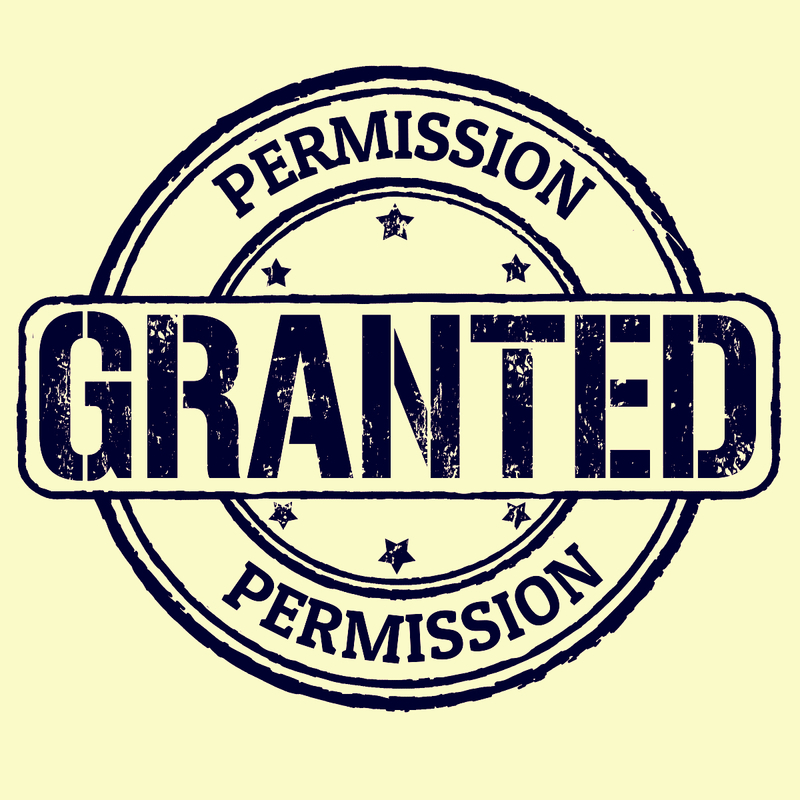 I can see the power of permission at work with the healing process of my private energy session clients. Their express permission for me to support them and their self-permission to heal are perhaps the most powerful conduits to the healing experience. Permission to connect with the innate lifeward, self-harmonising will of their systems; permission to let go of the stories they have built on being unwell; permission to tap healing lifeforce; permission to simply hold the possibility of vitality, wellness, joy, abundance and purpose is the key to full healing rising. Since working more explicitly with the power of permission in this context I have witnessed the most radical healings present in my time of working in this field. Transmutation happens when we give it permission to happen. Permission has shown me that we hold the ultimate authority over our lives, bodies, minds and hearts and especially our experiences of Spirit, yet so many of us don’t use it. Give yourself permission to know yourself deeply; to master the spiritual dimension of your life; to ‘do’ nothing from time to time; to experience the mystery, right here and right now. And there’s no need to worry about the ‘how’ or what ‘to do’. The permission alone is highly active and will draw the experiences to you. And if you need the perceived support, like my wall in the gym, find yourself a solid experienced teacher or healer or content to ingest. Permission is powerful. Why not put it to use?